Rally web page is ready to go. Additional details will be added (t-shirt, route info) as it becomes available. Link is also in my signature. Last edited by Jerry; 01-21-2019 at 09:58 AM. Thank you Jerry! Always appreciate that website for each rally. Well, I had to correct a few spelling errors and added a link to the Wikipedia entry for Wolf Creek Pass. Always some tweaking needed to get it right. As usual it is awesome and you are really appreciated! Harry texted today, after looking at his summer, he’s planning to make it to Durango along with a firm “looks pretty good” from Russ and Ivan. FWIW, Harry isn’t able to log on to the forum since whatever “saving” of the site was performed? We aren’t getting any younger, and would love to invite everyone that has had a thought to do a rally to make this rally or another this year. Yeah, I talked to him today also. Those 3 are all on FJR's now. Yeah, the FJR is a nice bike. Really liked the few times I have ridden one. If going that route, the C14 is a better fit for my height. Can’t seem to want an Adventure bike that would fit me well, I can’t get past the over grown dirt bike appearance. Hope all is well for the guys attending or contemplating the rally in Colorado this summer! Biding our time out here as this winter brings some really good snow. Wolf Creek Pass has had 400” of snow since September and the ski area has over 12’ of base at the top. Guys coming in from the east will most likely go over Wolfcreek pass and drop in to Pagosa Springs then onward to Durango. Even in July there still should be some snow to see with that much currently on the ground and another 2’ projected for this week and the current winter storm warning. As I sit here in my recliner watching men’s and women’s college basketball and now axe throwing on ESPN, one of the rides we will do this year is to tour the Mesa Verde ancient ruins. This is a fantastic place and the riding getting there is nice and relaxing. Will make a nice 120-ish mile day, $15 per vehicle entry. The other ride will be a duplicate of the main ride we did in 2011. This is excellent in terms of the roads, scenery (holy cow...) and distance of about 225 miles. Durango west to Mancos, north to Dolores, up in elevation to Rico (good gas stop/leg stretch) over lizard head pass and then to Telluride. From Telluride down to Placerville, over to Ridgway then south to Ouray, up over Red mountain Pass, down into Historic Silverton, and back to Durango over a few “smaller passes”. Like we did last year, I hope to do a Friday ride (destination TBD) for the guys that arrive on Thursday. Had a great time on that ride last summer. Let me know who is planning on arriving Thursday as things get closer. Last edited by Bonz; 03-10-2019 at 08:23 PM. Sounds good Mike, can you give me an idea of who/how many will be camping vs hotel. Harry texted for sure... He and Russ and Richard (rode the Magna at the Kremmling rally) are coming out, doing a hotel. Would guys post up here if they are coming, like to begin getting a good head count. Would like to have each participant pitch in $20 to a “rally pot”. Want to cover the expense for Joe and trailering out not only with his bikes (El Toro being a campground favorite each year that adds a lot of fun) but the grill, propane, coolers, chairs, etc and using his truck as the camp transport to and from the stores for dinner food, beer runs, etc. Looking forward to seeing the head count start to come in on who is attending. No plan yet, but do have Reservations in Durango 11th to 15th. Hope it works out that I can make it. You gonna ride the E Jeff? I just got a new trunk, the other one fell off and took a tumble down the highway. My road essentials stay packed, I just pack clothes into the trunk when I go. Coffee pot and fan are a negative. Gotta have the pillow for a backrest in front of the backpack though. Time is going by and getting closer to July! Had some great riding weather here in the front range over spring break. Got in over 600 miles in the course of the week, and now two decent snow events this week with the second one happening now and another coming mid-next week. 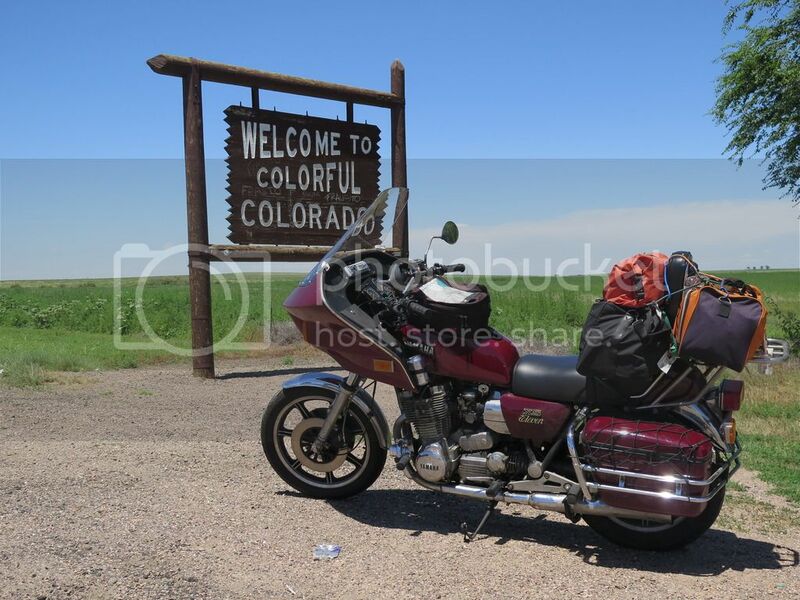 Keep the bikes tuned up and running well fellows, gonna be another fun time running the backroads and mountain passes.